Creative Gifts to Go, an Arizona-based gift store, updated its collection to provide a variety of quirky gifts and a personalized potato message service for Valentine’s Day, birthdays and other occasions. Creative Gifts to Go, a gift store based in Flagstaff, Arizona, announced an updated range of quirky gifts for Valentine’s Day, birthdays, weddings and other occasions. The collection includes infinity canvas wall art, personalized chocolate chip cookies, as well as a creative mail-a-potato service allowing anyone to send a personalized message hand-written on an Idaho potato and carefully placed in a beautiful basket. More information can be found at https://www.shopcreativegifts.com. With online stores offering a wide range of gifts, it can often be difficult to find a truly creative gift for one’s partners, friends or family. Creative Gifts to Go strives to respond to the increased demand for personalized gifts by offering a series of quirky presents that are ideal for a variety of special occasions. The updated collection includes a personalized potato message service allowing customers to send their unique messages to anyone throughout the United States. 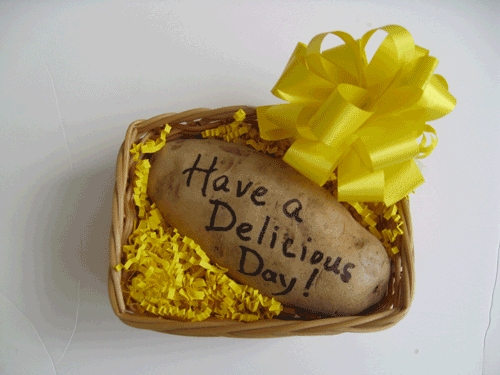 The gift store writes each message on an Idaho potato, places it in a basket and wraps it in cello, thus creating a beautiful gift that is suitable for lovers, friends and family. Custom infinity canvases are also available, featuring the infinity symbol and a personalized 20-character message or name. The 8” x 20” canvas can be hanged with or without a frame and comes with all the necessary hanging accessories. With the latest update, Creative Gifts to Go continues to add new products and services to its collection of quirky gifts. Established in 1992 as a local gift store, Creative Gifts to Go has grown into a nationwide gifting services with thousands of satisfied customers throughout the US.